In the first few days after leaving Wejh, progress for the car reconnaissance crew proved to be slow. In his field notebook, Lawrence recorded the Crossley tender becoming stuck time after time (“seven times in 20 yards” at one point) due to the sandy terrain and thick brushwood impeding their way (hamdh bushes, hence the name Wadi Hamdh). The crew were kept busy mending punctures. Then, late in the evening of the fourth day, the crown wheel on the back axle broke all its teeth, bringing the car to a halt while the crew carried out repairs late into the night. Throughout the journey, supplies of food and water, as well as spare motor parts, were delivered morning and evening by Captains Henderson and Stent of C Flight, 14 Squadron, Royal Flying Corps, in their BE2cs. But on the morning of May 1, Stent crashed into a tump on landing, and was forced to stay overnight with the crew and the still disabled Crossley tender. The next morning, Henderson landed, breaking the tail-piece on his plane. After the tail-piece was mended, Stent flew Henderson’s plane back to Wejh, leaving behind Henderson with the crew, before returning the next morning with replacement parts for the Crossley tender. The tender was then repaired and driven on to locate the plane that had come down on April 26. Meanwhile, Henderson flew back to Wejh, taking Lawrence with him. Once a replacement engine had been fitted, the BE2c plane that had been stranded on April 26 was flown back to Wejh by Stent on May 4, followed the next day by the Crossley tender. A meeting to discuss the forthcoming attack on the railway at El Ula took Feisal and Auda away from Wejh for a week. Meanwhile, two BE2c aeroplanes from C Flight of 14 Squadron of the Royal Flying Corps took off from Wejh to make an aerial reconnaissance of El Ula. When one of them failed to return, a third BE2c piloted by Captain Thomas Henderson, of C Flight, took off on April 26 to search for the missing plane. After the plane was located in Wadi Hamdh, where it had been forced to land due to engine trouble, a recovery crew drove out from Wejh in a Crossley tender on April 27 with replacement parts for the aeroplane. Among them was Lawrence. recalled by Lawrence as a “certain car adventure” in future years. Though not mentioned in Seven Pillars of Wisdom, entries in Lawrence’s pocket diary and notebook, along with Captain Henderson’s logbook, enable this adventure to be traced. 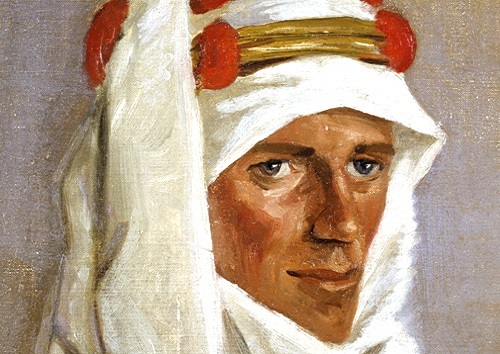 In the days following his return to Wejh, Lawrence set out to Major Joyce – now the senior British officer in Wejh – his new theories about the strategy of irregular warfare formulating during his days in Abdullah’s camp. By now, however, preparations were advanced for a major offensive against the railway at El Ula and Medain Saleh to force the surrender of Medina. With his fellow British officers engaged in planning the forthcoming offensive on the railway at El Ula, Lawrence was left to pursue the idea of advancing on Akaba from inland. Auda’s presence in Wejh meant the attack could now be discussed in detail. arrival of a newcomer at the camp. Auda, chief of the Eastern Howeitat, had come to Wejh to discuss the feasibility of attacking Akaba from inland. Abdullah’s lazy and self-indulgent nature. So when a letter arrived from Feisal, recalling him to Wejh, he made preparations to leave. “… there were now two parties on the railway, with reliefs enough to do a demolition of some sort every day or so. Much less interference than this would suffice to wreck the working of trains, and by making the maintenance of the Turkish garrison at Medina just a shade less difficult than its evacuation would serve the interests of British and Arab alike. So I judged my work in Wadi Ais sufficiently done, and well done. He left for Wejh the next day. Following the half-failure of the raid at Abu el-Naam, Lawrence rode out with a second raiding party to make another attack on the railway. Kilometre 1,121 from Damascus was chosen at random to lay a mine. But when the morning train arrived, carrying women and children towards Syria, it passed over the charges without explosion. It was not until after dusk that the raiders could return to the line to investigate why the mine had failed. The next morning would bring the distant sound of a great explosion and then news that a train had indeed detonated the mine. The raiders returned to Abdullah’s camp. One of the Ageyl was lying dead with a bullet through his temple. The remaining Ageyl blamed Hamed the Moor. Hamed confessed. “Then rose up the horror which would make civilized man shun justice like a plague if he had not the needy to serve him as hangmen for wages. There were other Moroccans in our army; and to let the Ageyl kill one in feud meant reprisals by which our unity would have been endangered. It must be a formal execution, and at last, desperately, I told Hamed that he must die for punishment, and laid the burden of his killing on myself. It would take three shots for Lawrence to carry out the execution.